The head of public affairs for the RSPCA has come under fire for branding a farmer who asked a question about badgers and hedgehogs ‘lazy’. Gareth Wyn Jones, a hill farmer from Llanfairfechan, used his Twitter account to ask the BBC Countryfile show if hedgehog populations were being driven down by increasing numbers of badgers. Do love hedgehogs great seeing them here @BBCCountryfile is the increasing numbers of badgers not helping these little creatures ? He told Farmers Guardian he was ‘really surprised’ when the RSPCA’s David Bowles snapped back ‘no evidence of badger population impacting on hedgehog – standard lazy response from a farmer #factsimportant’. “I was just asking a question”, Mr Jones said. “I have noticed there are fewer and fewer hedgehogs and more and more badgers. I do not have any scientific proof of this, but I work on the land every single day and as a child I used to see hedgehogs everywhere. It is definitely true badgers eat hedgehogs. “I did not even ask the RSPCA, there was no malice in it whatsoever and he came back with a very sarcastic and slightly nasty tweet. For a man of his stature and status as PR guru for the RSPCA, I thought he would have more common sense. 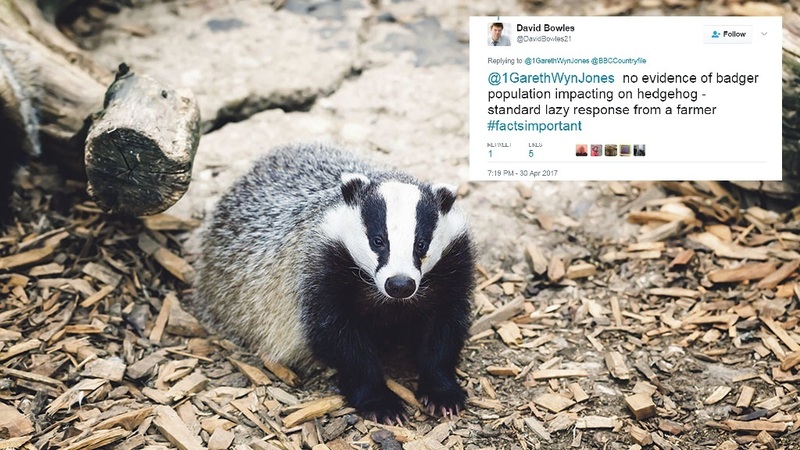 After making the comment, Mr Bowles was inundated with tweets from supportive users who demanded an apology on Mr Jones’ behalf and shared scientific papers which claimed to link badger numbers to hedgehog deaths. @DavidBowles21 @1GarethWynJones @BBCCountryfile Standard lazy response..? Why the attitude towards the people doing a great job of looking after animals and the environment? Standard lazy response..? Why the attitude towards the people doing a great job of looking after animals and the environment? @DavidBowles21 @1GarethWynJones @BBCCountryfile Excellent response from a society with a royal warrant 😲 did you get a NVQ in PR? Excellent response from a society with a royal warrant \uD83D\uDE32 did you get a NVQ in PR? @DavidBowles21 @1GarethWynJones @BBCCountryfile As an outsider with no sides in the badger debate, that seems a rude response to a decently asked question. Be careful not to alienate. As an outsider with no sides in the badger debate, that seems a rude response to a decently asked question. Be careful not to alienate. @PhilNash2 @DavidBowles21 @1GarethWynJones @BBCCountryfile For head of public affairs & campaigning this was a ridiculous comment & looking forward to response! For head of public affairs & campaigning this was a ridiculous comment & looking forward to response! @ClaraOlympia @DavidBowles21 @1GarethWynJones Standard lazy response from a lazy "head" of public affairs. Any thoughts @RSPCA_official ? Standard lazy response from a lazy "head" of public affairs. Any thoughts @RSPCA_official ? @DavidBowles21 @1GarethWynJones @BBCCountryfile In 1 comment you place further divide between the RSPCA & the agricultural industry. Wasted an opportunity to give a constructive reply. In 1 comment you place further divide between the RSPCA & the agricultural industry. Wasted an opportunity to give a constructive reply. @1GarethWynJones @RSPCA_official If the head of PR for the RSPCA can’t actually manage good PR... animals in the UK are doomed. Also his response is way lazier. If the head of PR for the RSPCA can't actually manage good PR... animals in the UK are doomed. Also his response is way lazier. Farmers Guardian has approached Mr Bowles for comment.